RUSH: We’ve got this story here. It’s all over the LA Times. A lot of people are talking about it, the approval of Congress, lowest in a decade. Los Angeles Times/Bloomberg poll. Just 27% of Americans now approve of the way Congress is doing its job, down from 36% in January when Democrats assumed control of the House and Senate. Now, listen to the opening paragraph of the LA Times story. ‘Fueled by disappointment at the pace of change since Democrats assumed the majority on Capitol Hill, public approval of Congress has fallen to its lowest…’ that’s absolute bunk! People aren’t upset with Congress because it’s not doing anything. That’s when people love Congress, most people. They’re upset because of what they’re trying to do and in some of the things that are happening. But the point of this is this. Thomas Lifson makes a great point here at the AmericanThinker.com. Congress ought to just get on with the people’s business and stop spending resources on trivial issues to besmirch the Bush administration, stop favoring terrorists, stop engaging in tactical measures meant to defeat the administration, and end the hypocrisy and cynicism. This lowest in a decade measure is occurring during a Democrat Congress. 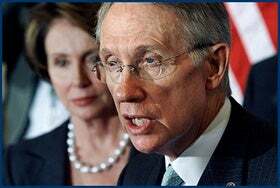 Reid, Pelosi, are running that show, and the lowest congressional ratings in ten years. All they’re doing is beating up on Bush every day, trying to get Alberto Gonzales canned. The Senate had a meaningless resolution yesterday, a lack of confidence, and the Republicans beat it back. They are, you could say do-nothing, whatever, but the key here is this is a great opportunity for the Republicans because the Democrats came in promising all these wonderful ethical reforms, none of which are happening. In fact, Boehner, the Republican leader in the House, says he’s going to go to war over earmarks because the way the Democrats are doing earmarks in the House now, David Obey is the author of this, and we were told, by the way, that back in November one of the reason Republicans lost is some of their voters were upset with all these earmarks. Pork. What David Obey is doing, they’re slipping the earmarks in after the spending bills have been agreed to and signed so that nobody knows they’re there until it’s too late to do anything about it. They’re basically doing it under the cover of darkness in bright sunshine. Boehner is prepared to go to war over this. But this is a great opportunity for somebody to show some leadership for a change on the Republican side, somewhere in Congress. There are a lot of things out there that the American people do want their government to do, and those things are not being done. And one of them is get this immigration bill right, get this thing fixed. And, by the way, there’s movement on that that’s a positive sign. You might say that this is a sign that Democracy works. Rich Lowry just posted at the corner that Saxby Chambliss and Senator Isakson were at the press conference announcing the Senate grand compromise but now they’re singing a different tune. There’s a silver lining in this cloud, too. In addition to the bill being temporarily dead, the silver lining here is that millions and millions of Americans are seeing that big government can’t get anything done and that big government does not respond to the American people. Now, what Lowery means here that there may be a sign that democracy works here, is Saxby Chambliss, he was — I mean after this thing was announced in secret and they came out and started selling, he was on the trail, one of the loudest salesmen, one of the loudest spokesman for this now defunct bill, he’s done a 180. He’s heard what his constituents have to say. But in this situation, most of the people involved in this bill who are for it know exactly what the people of this country think and don’t care. It’s like Dianne Feinstein said yesterday or Sunday, whenever she said it, ‘I have never received more racist and hate-filled phone messages and e-mails in my 15-year career in the Senate.’ We all know what that’s about. That’s to discredit the critics so the next time they bring the bill up, the people being criticized can throw it off and laugh it off because that’s just coming from a bunch of kooks. Now, this is big because this is a senator telling the leader of his party who happens to be the president, ‘Mr. President, you don’t have anything we need anymore.’ Lame duck, whatever you want to call it, there’s no reason for us to jump in line behind you. And besides, we don’t believe in this thing anyway. So back off and come back and do this and get it fixed. Saxby Chambliss and his guy, Johnny Isakson, have the right idea, get border security and move on it fast, and they might have some fortune, some good luck in turning around some public opinion on this, if it actually were to happen. Rich Lowry has a great piece in National Review Online about how long it took us to build the Empire State Building, like 431 days. The Hoover Dam got built in the Great Depression in very short period of time. It cost a lot of money. And we’re being told we can’t build a fence. We can’t build a fence. The Hoover Dam — I’ll go through the details here after the break about what was involved in building the Hoover Dam and what a monumental undertaking that was. Well, the Golden Gate Bridge and the Bay Bridge happened in the thirties as well. Now we can’t build a fence. It’s frightening that we’ve lost this dynamism and we lost the will to do these things. ‘Oh, we can’t do that,’ and these things can be done. We’re the United States of America. Anyway, Dingy Harry now blaming the president, told Bush the only hope for the bill is if he can come up and deliver more than 20 Republican senators to break the filibuster and pass the measure. Dingy Harry said he’s maxed out at 38 votes that they delivered on a test vote last week. He’s 22 votes short of breaking the filibuster. Dingy Harry said, simply put, we need many more than seven Republicans to vote for cloture and final passage of the bill. Now, my question is, Dingy Harry, you’re the guy that runs the Senate. The problem is, if you can’t get all 51 of your guys in lockstep on this, why is it the Republicans — well, we want a partisan bill, it’s the president’s bill and all that. So he’s dumping on the president to get the votes and the president’s up there trying to accept the challenge. Now we get to the Senate’s grand compromise on immigration and how we can’t build a fence, and we can’t do this and we can’t listen to the people, and we can’t get it right. I’m going to tell you, you look at past achievements, when the government actually did good things. That’s why I say, the opportunity exists here for the American public finally to have their fill of big government and understand that it is not the answer to their lives. RUSH: RUSH: I checked the e-mail here during the break, and I want to thank those of you who asked me this question, because it enabled me to focus my answer. ‘Rush, we don’t quite understand why this immigration bill failing and all this is going to make people think that government, big government is inefficient and doesn’t accomplish anything.’ It’s because of this, folks. The reason the immigration bill failed is that none of us believe what they’re telling us about it. We know it’s not going to work, because be it hasn’t worked with the current legislation that we’ve got because it’s not being enforced and so they’re insulting our intelligence. This is something that the elites and the political class have constantly done. They’ve talked down and they’ve been a bit arrogant and they conclude that the people just don’t have enough experience, education or knowledge to understand the intricacies of their jobs, but we just don’t believe what we’re being told about this. We don’t believe what the president’s saying about it. We know it’s amnesty! They say it’s not. They’re telling us we don’t understand it. We read it. We’ve had people that have read it. They’re telling us that the Z Visa is not what we think it is. It is. The Z Visa means you are legal after your 24-hour background check. By the way, speaking of a 24-hour background check, do you know that there are people all over the country who made summer plans traveling internationally who went through all the right procedures to get their passports and they still don’t have ’em because the government that says it’s going to protect the borders and make sure they’re going to find out in 24 hours every one of these Z Visa holders whether they’re legal or not do a background check? I have a friend who works in a congressional representative’s office in North Carolina, and these people have done everything they were supposed to do. They applied ten to 12 weeks before their trip for their passport. They’ve gone out and they’ve purchased the various elements of the trip that are nonrefundable. They can’t get the money back, and now they can’t take the trip because the federal government can’t get ’em their passports in 12 weeks, and they live here! They’re in the white pages! They have Social Security numbers. They pay their taxes. There are any number of records the US government has. RUSH: Dean in Dallas, I’m glad you called, sir, and welcome to the program. CALLER: Yeah, Rush. I can’t believe they’re up to it again, you know, Kyl and McCain? I call them the ‘amnesty brothers.’ You know, after getting a clear message last week, they’re trying to do it again, the backdoor deals with the Democrats. CALLER: I believe they think there’s a lull here in the anti-amnesty pressure so they’re trying to sneak through again. RUSH: They are wasting our time. They’re wasting their time and they’re wasting our time, trying to revive this, because as I just said: Nobody believes what they’re saying about this. They have lost their credibility. Nobody even believes the motives that they assign to themselves for caring about this. Nobody believes a thing about this that government officials are saying. But I told you on Monday they’re going to revive it. They’re going to try to. The president’s up there having lunch today trying to get Republicans to change their mind and vote for this thing. CALLER: Well, let’s build a wall first, then figure out what to do with the 28 million illegals later. It’s that simple. RUSH: I’ve been trying to say that, but see, they’re not interested in that. (sigh) The people that want this want a steady flow of illegal immigrants so that they can be utilized for low-wage labor, and they can be controlled because they’re uneducated, and they’ll end up needing social services. They’ll become dependent. This is the desire of big government: to get bigger and bigger and bigger. People instinctively know this. This is not hard for people to figure out, which is why there’s so much opposition to it.